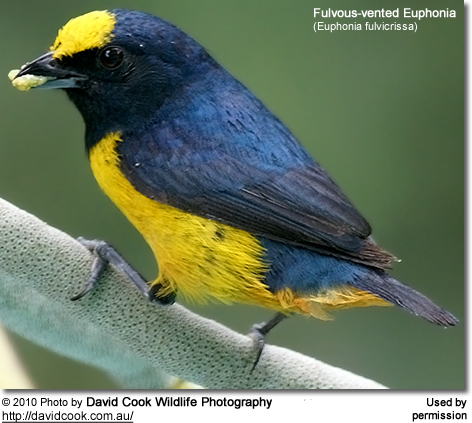 The Fulvous-vented Euphonias (Euphonia fulvicrissa) are finches that occur naturally in Central and South America; specifically Panama, Colombia and Ecuador, where they inhabit subtropical or tropical moist lowland forests and heavily degraded former forests. Range: Central Panama - from Coclé and Colon on Caribbean side and Panamá on the Pacific side); eastern to western Colombia (northern Chocó). Range: Northern base of the Colombian Andes - from Antioquia east to the northwestern end of the eastern Andes in Norte de Santander) and the Pacific coast south to Cauca. Range: Southwestern Colombia (Nariño) south to northwestern Ecuador (Esmeraldas, Manabí and northwestern NW Pichincha). Euphonias are known for their almost constant singing. Their best known calls sound like "Pe-we," "see-see".